When cooked the asparagus should still have plenty of crunch. serve immediately, with melted butter & topped with a poached egg. Out to supper last night, we had asparagus wrapped with bacon and grilled – delicious! My other favourite is asparagus quiche, but that takes more time! the cooked asparagus may be reheated, after refrigerating, in a touch of butter. More recipes can be found on the deliciously Yorkshire site. Research by the regional food group has shown that Yorkshire Asparagus is sweeter than imported asparagus. 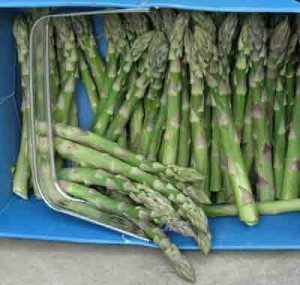 The regional food group tests indicate that Yorkshire asparagus harvested from the end of May to the beginning of June tastes better than imported asparagus because it has a higher sugar content. The higher sugar content in Yorkshire asparagus is the reason for them tasting sweeter when you cook them.